I've been working to get some stock into the new Etsy shop. For now, it's primarily notecards and Hogwarts (Harry Potter) bracelets. 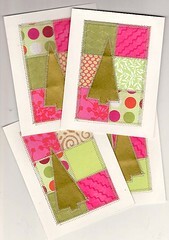 I had a request for Christmas cards, so I put together three different themes/colorways. They were very fun to do! The cards on the left are probably my favorites. I like the fusion of 21st century and mid-century (1950s) colors and shapes. I have lots of ideas of what to try -- and have no idea what will sell. I've paid to be in the main Showcase this Sunday and the following Friday, so I need to get the shop stocked up as much as possible! the cards look great - love the designa and the colours!